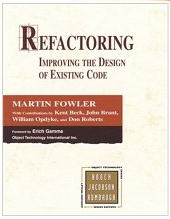 Jon Aquino's Mental Garden: Better Names for Martin Fowler's "Refactoring Smells"
Better Names for Martin Fowler's "Refactoring Smells"
The worst part is that these names give little clue as to what they mean. I would also like to improve on "Shotgun Surgery" (in which a modification involves touching code in several places), but I cannot think of an apt name. Any suggestions? posted by Jonathan at 1/13/2007 01:43:00 a.m.
your suggestions are confusing. don't attempt to sound clever - the Fowlers names are crystal clear, and your names are opaque. By Anonymous, at 1/13/2007 2:59 a.m.
By Jonathan, at 1/13/2007 1:30 p.m. I find "code smell" a little unpleasant so I know where you are coming from. But I _like_ "feature envy" and a few of the others. They give a flavour of the problem at least as well as or perhaps better than a straightforward description of the problem. "Small Class" isn't immediately a problem, but a "Lazy Class" is (it doesn't do enough, right, and I last picked that book up in about 2001 so that isn't from memory). By bakert, at 1/13/2007 4:12 p.m.
bakert - Yeah, I kind of like Shotgun Surgery myself. By Jonathan, at 1/13/2007 5:21 p.m.
Perhaps "Tiny Class" instead of "Small Class"? I'm not in favour of "Lazy Class" because lazy has several connotations (notably "delayed"). By Jonathan, at 1/13/2007 5:23 p.m.